I’ve been reading the posts of many of my blog followers this week. (I’ve tucked away my murder mystery for a while and will continuing editing it with a fresher mind at some later date.) These bloggers, from all over the world, are a caring, supportive group. In reading their posts, I sometimes come across a comment about family or friends who have let them down. People they love who should be there for them but are not. This resonates within me because in my own life I often find myself searching for an understanding of why someone makes the conscious choice to take care of strangers before taking care of their own family, friends or neighbors. I look around me and I seem to be surrounded by people who openly display, what I term, “The Missionary Zeal” while ignoring the needs of those closest to them. Next door to me is a family (mother, daughter, grandmother). The mother is in the hospital recovering from a serious operation to remove tumors from her lungs. She has a feeding bag and a tracheotomy. The grandmother recently has undergone two operations for a hip replacement. I often visit her and she confides in me. The granddaughter, a young woman in her twenties, is in her final semester for a nursing degree. Last month, the girl moved out of the house to live with a boyfriend just when her mother and grandmother needed her the most. There is no rift in the family. This girl visits her grandmother intermittently to drop off bills to be paid. In order for her grandmother to come home to recuperate, someone is required to be in the house. Instead, she has been placed in a nursing home. The girl’s mother will also need support when she finally returns home. This young woman will be a practicing nurse within the next few months, taking care of people incapacitated, sick and in need. She’s smart and personable and will surely do well. She’s at the top of her class and spoken of highly at the local hospital where she’s interning. A close relative (with a degree in social work) is a big advocate of writing letters. A few years ago she sent an editorial to the local newspaper, touting the merits of letter writing as a lost form of communication. Apparently she is a prolific letter-writer and values communication. To me she sends a Hallmark card every so often, with a small note included. Over the past years I’ve called her home and her cell phone and left messages; sent emails, gone unanswered; emailed cards with lovely art and music accompaniment, unopened. She calls me every two months or so saying “We have to get together soon”. We live less than an hour from each other. When her mother was ill, I was there for her until she died. Yet her own daughter, the social worker, was nowhere to be found. She even bragged to me about visiting a local nursing home regularly with her son to brighten up the inhabitants. When her children were young, I spent much of my free time with them. I was always there. They are adults now. Busy adults who never call or even send a card to remember a birthday. She’s taught them well. I know good people, volunteers who travel regularly to disaster sights or impoverished countries. They do fundraisers for the children in far-away orphanages while in this state we have so many children needing loving homes. A local news channel features “Tuesday’s Child” each week about foster children looking for someone to love them. And we have homeless families in need of a helping hand. Yet, these good people take vacation time and pay their own way to other countries to offer help and sympathy. Our nursing homes are filled with residents whose family’s hectic lives leave little time for them. They sit for weeks waiting for the occasional call or visit. I see a future nurse who chooses not to take care of her own mother and grandmother. I see a social worker who espouses the value of communicating, yet barely takes the time to keep in touch with family. I see people alone in nursing homes and hospitals with no advocates to hold their hand and offer consolation. It is rampant, this Missionary Zeal. I’ve observed it in my own family; my husband’s family; in the lives of our friends and neighbors. Seemingly good people who avoid making or taking time for those near to them while going out of their way to present a facade of beneficence to the world. There are connective strands weaving their way through all of this – threads of denial, self-absorption and casual cruelty. And what about those who are always there? I’ve observed, too many times, that they are taken for granted; their caring diminished in some way – “They have more time.” translated to: Their lives are not as busy as mine, not as important. Just this week my husband Charley was talking on the phone to one of his relatives. He was discussing the fact that after eight years, his cancer was in remission. (Aside from a card or two, his relatives have never shown any semblance of support for him throughout all of his operations and treatments.) He was sharing a little of what these grueling experiences had entailed and said, “Clare has always been by my side, holding my hand, crying with me, being my advocate. She’s the reason I’m alive today.” Her glib response to him was, “You’re alive because of the medicine.” He was stunned by her blatantly callous attitude. Having observed many incidences of her callousness to him in the past, this dismissive response did not surprise me at all. When Charley and I discussed this later, we marveled at the relative’s naiveté about dealing with a serious illness. I couldn’t help but wonder what would happen if this young woman’s husband was suddenly diagnosed with cancer and they had to endure the journey Charley and I have taken together. I wonder if it would make the marriage stronger as it did with us or tear it asunder? Very important post Clair and I see this all too often as well. It seems people are too busy or think they are too busy for others that are in need of some company or some assistance. We are going terribly wrong I think. As the world shrinks and we bring up our children to feel they are entitled to the life they want we are forgetting the simple lessons of our forefathers – the natural cycle of life that means that we are looked after brought up to know that we will nurture and care for those that cared for us and that in turn those we have nurtured will take their turn looking after us when the time comes. It is time for a change but to affect change there must be a willingness and I fear that willingness is more and more evasive …. Sadly it is not only in the US – it is pervasive in the UK. I think the fact is that the less ‘developed’ the culture the more careful it is of it’s own vulnerable extremese – children and the ageing. That medicine is making the most vulnerable more likely to live longer is almost a dreadful irony in many western societies. I used to have a bumper sticker from the UK Canine Defence League that read ‘A dog is for life, not just for Christmas’. People would do well to remember that the same is true of their children and those same children would do well to remember that the same is true of their elders. If this is truly a universal problem and not just symptomatic of American values, then we all need to redefine why we’ve been placed on this earth. And I am sure it is not to acquire material goods or dismiss other’s lives as being less important as our own. How we go about this is something we need to continue discussing whenever the chance arises. How we are bringing up our children and the values they are taught along with what we should require in the characters of our religious and political leaders are at the top of my discussion list. I’m 100% with you on this one … whenever the opportunity arises we MUST get the discussion started and fan it’s flames. It is the single most important issue facing the world today because without an understanding, a compulsion that we look after our own how on earth are we going to help others ….. I think a revolution is in order. A peaceful one, though. An interesting and honest post. It seems to me empathy is a commodity in short supply (as is common sense). A ‘friend’ sent me an email hoping I was feeling better – the day after I’d told her about my closest friend taking her own life a day earlier. I was devastated by my friend’s death, with all the accompanying feelings of guilt for not having prevented it happen, and I couldn’t believe I was being asked if I was “feeling better” 48 hours after it happened. The scenarios you describe are not happening only in the US. When I was caring for dad through his dementia I came into contact with nursers and others in the caring professions – support workers, social workers – and often wondered why they were in the jobs they were doing. And the scenario I can never get over, nor forgive, was when, after 40 years of marriage, my stepmother left my father when his dementia became more problematic because she felt she was entitled to a peaceful life. Yes, I remember your stepmother from My Dad Is A Goldfish. At the time I was new to blogging and had not conversed much with you. But I still felt how difficult it must have been for you to cope with you Dad’s dementia and the callous people you had to deal with on a daily basis. And don’t get me started on The System that makes life as difficult as possible for people in times when they could use help and comfort. I’m a terror when I have to deal with incompetence. This has worked very well for me and Charley although it takes a lot out of me to have to fight for things that are crucial. The many feelings experienced by the suicide of your friend must still reside deep in your heart.They never go away and anything can open the wounds and bring those feelings roiling around you. A song, a poem, a flower, food…any little thing. Suicide is the cruelest death for the poor soul who needs to be free and the caring souls left behind. I am deeply for your loss, Mary. There’s a lovely happy post on My Dad’s a Goldfish just now. Do have a look – there’s not much to read as the pictures tell the story. I agree with what ladieswholunchreviews says about people being paralysed and not knowing what to say. Blurting is good. It’s certainly better than silence. Thanks for your kind words about my friend. It is some years ago now but I sill miss her dreadfully (I probably spent more time in her company than I did in my husband’s because she was my boss as well as my friend) and her death still weighs heavily on my mind. Mary, I am going to that post right now. I’ve read all the original Goldfish posts, but have been catching up with your most recent ones in the last few days. You’re welcome. I wish I knew how to help. My friend’s husband committed suicide five years ago. She is deeply hurt and I still don’t know what to do for her except to listen. I feel your pain…regarding the loss of your friend through suicide…I had a similar experience three years ago. People do not seem to know how to BE present to others in time of sorrow…sickness…or difficulties. It takes PRESENCE. You have my deep condolences regarding the loss of your dear friend, Mary. You make a very good point. It does seem difficult for people to deal with the hardships of others – a type of denial, I would guess. But adding to that a dismissive attitude for people who do the right thing is just unacceptable to me. I can’t bear it when I see it happen. And the whole celebrity thing is out of control. The money they spend on outfits alone for their special fundraisers could feed a third world country for a year! thanks for your comment. It has added more to think about. Yes, avoidance is one way people deal with coping. But avoidance is hard on those who are really in need of some consolation. I think your understanding of the situation was insightful and caring in itself. And I love the fact that you are now a blurter. You are definitely my kind of people! I think so, too! I’ve also found sometimes I need to ask when I need something from someone, that they usually want to help, just don’t know how to offer. I like these chats! Another good point. We need to realize that some people are reticent and it is up to us to ask for help when we need it. If they choose to walk away, then that’s another story. And another hurt. Whenever I write a “serious” post, I love the comments that follow, It really does help me to see things from other points of view. Thanks, I love these chats. Well, you described things which I also see quite often! I don’t understand how our world works, very often I even refuse to understand. Unfortunately, many people don’t deal with conscious and simple kindness, everything and everybody became more cruel and indifferent, too much concentrated on careers and money. In fact, we live in a materialistic world where it is easier to talk to a stranger rather than a relative…it is a pity, but let’s hope there is always a chance to change it for the better! Let us believe that people will recognize it and will try to improve…let’s believe that human features will be brought back! Thank you so much! To this day, it’s the hurtest I’ve been in my entire life possible! U mm most hurt . .. I know this is most impertinent and assumptive (?) of me, Dr. Ruth, but … maybe she was never your best friend? …I am at a loss for words…reminds me of a response I received from a person I had known since I was 14…upon revealing to her WHO I was…She said to me, “I love you for who you are, but NOT the WHAT you are”—left me totally confused! How can a Christian, not love a Jewish person, when Jesus was a Jew—and how is that being Christian, by being such a bigot??!! Self-absorbed and stuck in religious fear. When I read stories like yours, I want to run into the enchanted forest and find a cave and live on berries! Still…it is a loss…painful…sorry for you! Our Church (Congregational) just voted to be “Open and Affirming”. They always have been, but they voted on it, put it in writing and expects its members to act in a Christian manner. So,thankfully, not all churches (religions) are dogmatic. Our pastor has declared this year to be one of outreach. We have been to dinner at a Muslim Mosque and they have been to a dinner at our church. We are planning on going to a Jewish Synagogue and will have them back to our church. Hopefully, these relationships will continue long after the visits.More churches should follow his lead. I would say your Basque friend was wise indeed. You’re doing much for those who are being cruelly treated. Thank you for saving the star fish you can. Their world and ours is all the better for it. I’ve seen a lot of this even in my own family. I have an older brother who never visited our mother when she was ill. After she died, he bragged about visiting his aunts (her sister and sister-in-law). He would spend time with other older women but not the woman who gave him birth. Our home wasn’t toxic. She was a great Mom and very supportive of him. Neither I nor my other brother ever figured it out. I haven’t seen him in 25 years. And oh yes, he is a deacon in his church. My uncle was like that-only he didn’t visit anybody. My grandmother adored him. (We called him “Baby Jesus”.) My mom and aunt took care of her and were always there for her, but the only one she wanted was the one who seldom came. These people are a true mystery to me, Kate. And you touched on something in your last line that I didn’t even get into (and probably should have) in my post – hypocrisy. The people who are the most callous seem to be the ones who need to present themselves as caring,righteous people. I think that’s where the rationalizing and dismissiveness of those doing the right thing comes in. You wonder what goes on in their heads (or hearts)? I guess I’ll always wonder what happened to make him feel the way he does. My mother always said he was a difficult child prone to tantrums (unlike his cherubic sister and other brother). He was a very smart man who made very poor decisions. That definitely sums it up, but will never excuse what he did to your mother. Clare, this post really resonated with me. I can truthfully say this is not an American illness, I’m Greek and could describe quite a few cases like yours. I have personally been hurt by people’s indifference but at least I have always had someone to lean on. I often think of those who are left totally alone thought the be great of their nearest relations. Yes, Charley and I have each other and we’ve both experienced the casual cruelties of friends and family. But having just one person there for you is all you really need. Even so, I can’t help think of the souls who have no one. We see them in the hospital waiting for treatments and when Charley reaches for my hand, I know what he is thinking. I always try to be mindful of them, talking with them for a while. But what happens when I have to leave? I’m glad you have someone, too. I have no doubt whatsoever why your Charley is recovering today! Riveting post. May I first say that I’m thrilled to see your husband so appreciates your caregiving and support. May he heal and live a long and healthy life. 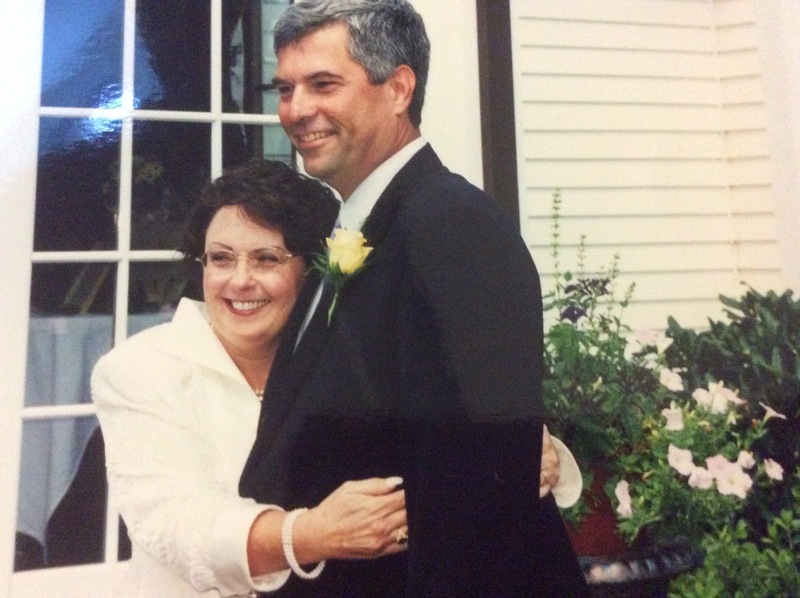 I lost my own husband to cancer in 2008. After that I was a caregiver for my dear (late) mother – in my house; in spite of paid caregivers, I gave up a lot, wanting my mother to be as comfortable as we could make her. So your post really resonates with me. Thank you for sharing your thoughts. Although I don’t sew, I still love to visit your blog. I can’t get to it from your link, now so I was glad to find you on Twitter. You’ve hit the nail on the head with “Their lives are not as busy as mine, not as important.” Busy-ness is a disease and a goal for the shallow folk such as the people you’ve mentioned above. Anymore I shrug them off. No point giving them the attention they crave for behavior that makes me dislike them. I model how I believe we are meant to behave toward each other– and they can take notice or not. I think that is all we can do. If we let their behavior determine how we will act, then where will we end up? .We just need to keep doing the right thing, as you advise . How unfortunate people no longer have compassion for others, especially family members. I am so glad Charley is doing well. Having you by his side was what gave him the strength to pull through, not the medicine. Charley knows what has gone into this battle against this disease. All the medicine in the world can’t help if you don’t have the fight inside you and someone who will take up the battle when you’re down and can’t see the sunlight on the other side. You know what I’m talking about and can appreciate how I felt when his relative was so dismissive. But I’m sure it had to do with her own guilt for never being there ever when her dad needs her. Some people do not deserve the wonderful people they have in their midst. Yes, so true. Life is too short not to care and help one another. Yes, it probably was her own guilt, which unfortunately, she may never see it in herself. And she’ll go on being mentally, emotionally and verbally abusive to her Dad (because she can) until he’s gone and she won’t be able to make it up to him. I’ve really tried to intervene, but have only ended up being the scapegoat. I’ve stepped back and it has helped me be more objective. This is really a good thing to do. I call it my screwer/screwey philosophy: You can’t get screwed if you’re not in the room. It’s especially good to use if there is a toxic person in your midst. Yes, I agree and it seems like a good idea would be to distance yourselves from her. A toxic person is nothing but bad news. Unfortunately we live in a world of double standards to the highest level and that’s all there is too it. In the UK a young girl disappeared and the country went nuts about it. It was in the news every day, newspapers and every TV bulletin lunchtime and evening, whatever. Of course it was awful and I cant imagine what the parents must have been going through, not just for her loss but the massive media attention it brought. However at the same time, in recent decades our armed forces have destroyed countless families which is often unreported. We all see ourselves as compassionate caring people but I’ve seen lots of people vanish when someone is depressed or sick. My friend went blind and half his so called mates never came to see him in hospital during his year and a half of tortuous Chemo’. At the end of the day, I take the unfortunate view of not expecting much from anyone these days, apart from the wifey and my awesome lovely Mum that is 🙂 Interesting post Clare. Why people focus on one situation and miss the big picture is beyond me. That little girl in the UK is very important but so are the children of refuges who are dying every day and the little girls who are in countries that do not value them and the children in our neighborhoods who need foster homes or advocates. I am overwhelmed by much of this and the way I cope is to make sure those around me are cared for. If everyone followed this path, I truly believe it would result in a better world. Your Mum must be awesome to have such a lovely son and your wife is not only smart but has great taste in men. And, yes, there are some inside jokes in A Berkshire Tale for the adults reading it. I personally like the allusion to Charlotte’s Web at the end of the book. Great taste in men ha ha ha Thanks. I try and see the bright side when I can and keep my head down otherwise it’s easy to get upset about everything. I don’t even know what they do and I am trying to become more meditative, so less venting should result. Notice I said “should”. Now I’m thinking about your regrets comment and being quiet.We have to work on that…#noregrets!!!! Well I wouldn’t regret your last post Clare as it was really valid. I’ve always wondered about the double standards people often have but never had a platform to talk about it. Nice one on that. #LOL The problem is with mistakes is that although people always say you can learn from them, some of them cant be undone. Hey > without wanting to dump another website on you, have you ever checked out Goodreads? So many bloggers talk about it, but I haven’t been there yet. Not quite sure what is entailed. I think I’ll try it now that I will be publishing the mystery (if I ever get back to editing it.) Thanks, I might just like it. And I suppose there’s a lot of reading. I tend not to do much reading when I’m writing. (I just stopped myself from doing the slashtag amwritingthing. )No more for me, either. I will check it out and see what the profile entails. Cruelty should never be casual. Or oblivious. But you’re absolutely right, that so many people treat close family that way. Too close to really see their pain. The fact that people have health care seems to make their relations feel no responsibility to help them. Your nursing story made me wonder if her mother and grandmother are worried about her supporting herself down the road. Maybe she feels she must be employed outside her own home, and that potential employers won’t view her caring for her relatives as work experience. Women used to stay home and care for relatives, but eventually they were left alone, without income for retraining and too old to start families. I do wish that work women/men do within a home was seen as valuable. Caring for children isn’t viewed as preparing you for any job other than the most menial, but it’s essential work. Caring for sick relatives is also valuable work, emotionally, physically. I’ve read that men married to women live longer. And that women chatting with other women are healthier and happier afterwards. We need that in-person connection. No doubt you are a large part of why your hubby is in remission. Congrats for that!! Thank you Brenda. Yes, we definitely have to factor in the Women/Men issue. It’s been there forever. I cannot think of a more valuable job then caring for family. And nothing in our society is as undervalued as that. It needs to change and I am seeing statistics rising on the number of men who remain home as caregivers and love the time they have with their children. Perhaps this will precipitate change? I am definitely a communicator on all levels and have had to teach Charley that it is okay to give an opinion or speak. We’ve only been married 15 years and his ex discouraged any independent thinking in her house. He is getting much better at it, but needs me by his side all the same (his words). Chatting is a healthy way of approaching a problem. This comments following this blog have really helped me. Your commenters all seem touched deeply, as I was. It’s a hard issue in today’s world where we can all be in constant touch via social media, but rarely in face-to-face contact. Brenda – I don’t understand why anyone would want to text instead of calling and hearing a person’s voice. Skype is wonderful if you are far away. But texting???? And Face Book has always got my nettles going! The people who have stopped by to comment are bloggers I’ve been reading for quite a while and because of what I’d been reading, I was not surprised that my post set off such a conversation. Texting is only good for logistics — I’m done at the dentist, be there in 10. It’s invaluable for setting up my daughter’s playdates and checking in. But otherwise, no. I’m a face-to-face type, aside from blogging. But then I have relatives who use it in place of calling or emailing or even visiting. They think this cursory form of communication can take the place of real contact. How R U I M O K just doesn’t make it for me. My niece once told me when I was on Face Book that I used too many words. She thought I would be a good blogger. LOL! Brenda, I just realized – you are my 500th follower. Thanks for visiting today. I didn’t even know my own statistics. How cool is that? I think I visited because you liked a comment of mine somewhere, although my memory of where is failing me. I usually follow up on things like that out of curiosity. And I love the name Zu-Zu. I’m an avid comment reader. I think they’re really important in blogging. And I follow up on anyone who likes or comments any of my posts out of curiosity. ZuZu does have a ring to it. We refer to the 10 stories in her book as the ZuZu Series. I began my blog and it was about A Berkshire Tale and the places in it and theme of reading with children at an early age. But then it morphed into something else. I began to write about my husband Charley and our battle with his cancer. And I wrote some posts about trips we were taking. I still write about the importance of reading with children and use my own book when invited to classrooms. But bloggers began to ask about my other cat, Roxie and I began writing posts from her point of view. Roxie aka The Other Cat. (The one without the book.) She’s become an ongoing character in my blog and is clamoring to write a post as we speak.So there are 2 cats in this blog and ZuZu has taken a back seat to Roxie, much to The Other Cat’s delight. I began my blog as a place to put up my stories. People would ask to read them, and I didn’t want to make more copies. Then I shared photographs and poems, trying always to stay true to my original blog concept – safe for kids of all ages. Rated G. LOL It feels a bit confining some days, but most of the time, it’s great fun. Perhaps Roxie wants her own book. Yes, your stories need a blog of their own. Throughout the Roxie posts she is trying to get my followers to convince me she needs her own book. In one of them she even designs the cover and picks a title. She now has her own fan club of my followers complete with agent and president. Time will tell if the world is ready for a Roxie Dammit book. Ah, she’d got to you!!!! Wow. I have to say this post struck at my heart. Clare, you could add me to your stories of people who have abandoned family during health crises. When my mother-in-law had her mastectomy two and a half years ago we didn’t visit at the hospital and only brought food over once. We never ask her about how she feels or if she’s had follow up treatment. She could say, and I don’t know if she does say, terrible things about my husband and I and how we treated her. Families are complicated though and he and I have had our own life tragedies which have been dismissed and discounted by her and our actions are taken because of our own bruised hearts. Maybe someday my daughter will abandon me in a health crisis, but if she does it will be hard for me to pinpoint who she learned abandonment from. The closer your ties to someone the more of your relationship is behind closed doors. In our own life we know the whole story, but when looking into others I leave some room for doubt. The people making the selfish choice might be bad people, they might be selfish, but might they have reasons we can’t see? Just another perspective in a lively discussion. I’m really glad you brought this into the discussion. I have a way of handling these toxic people. It’s called my screwer/screwey Philosophy and goes something like this: If you’re not in the room with the person who wants to screw you over, you can’t get screwed! CAsual cruelty is a good name for it. I know what you’re saying, Melinda. I decided to write this post at the very last minute on Saturday because of 3 callous things that happened to me on Friday. 3 callous, dismissive incidents in a few hours time! Enough is enough! I had to find out if I was the only sucker in town??? And I’d noticed other bloggers mentioning this type of thing in some of their posts and comments. I think we need to be there for people but as the poster in the intro says: Be kind but don’t let other people abuse you. 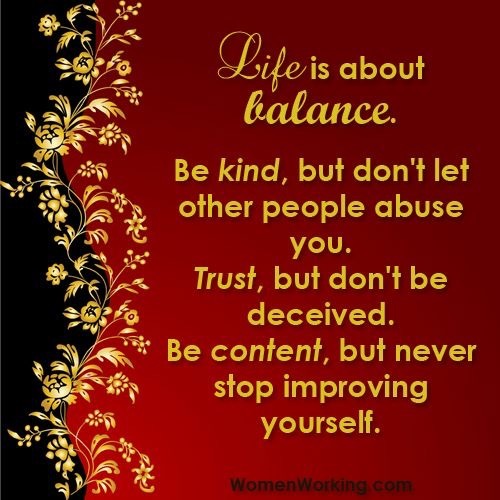 Keeping a Balance is not as easy as it would appear. With the first scenario I expect the granddaughter is too interested in her own career, which would have to be put on hold indefinitely if she is to stay at home looking after her relatives. You have to be a special kind of selfless person to give up a career to stay at home on a pittance and spend the days carrying out personal care to very sick people. I know I wouldn’t want my sons or daughters-in-law to do this for me, and I’d rather go into a nursing home. My mother, aged 91, goes out of her way not to involve me in any of her care. I suppose at the end of the day it’s up to the individual. I hope I’m not casually cruel to other people. I certainly don’t mean to be. I do often feel guilty, though. My greatest problem is not callousness but the fact that those I love are spread out right around the world and I simply don’t have the resources to visit them or give anything more than my time and moral support to them. I can imagine it must be very wearing to be surrounded by callous people. I do have a few relatives like that, but thankfully fairly distant ones (in every sense), so our paths seldom cross. My immediate family and friends are all sweet people, thank goodness. Although you’ve had some bad experiences with callous people, it’s good that you have a number of supportive friends too. A true friend is a priceless thing indeed. Sometimes, it is so hard to know where the line between self-absorption and empathy lies, or why a situation that brings out caring for strangers doesn’t seem to encourage it with those near and supposedly dear.. I suspect for some, as has been mentioned, fear, denial, previous toxic experiences may be involved. I had to distance myself from my father, whom my sister cared for in his later years (in CA) but I cared for my mother as she battled cancer (in NY). I don’t know what others might have thought about that, but families can be very complicated. In your personal situation, I find myself wondering about Charley’s daughter. I wonder if her medicine comment came from callousness toward him, guilt and/or denial, resentment of you or lack of acceptance of the ending of her parent’s marriage however long in the past… none of which excuses not being there for her father. As you said, perhaps she will rethink this, hopefully in time to change it. At the same time, I am sure Charley feels very lucky and blessed to have you as his wife, his best friend, his greatest advocate. I also can hear your fierceness in wanting and working to support and protect him, so having to watch him be hurt in this way must be hurtful to you as well. My latest “betrayal” was my “best” friend. I had been there though thick and thin as she cared for her husband in his final years. We always did things on her terms because of the demands of his care. After his death, for the first year I wrote off her use of me as because she was grieving. Then I went through a serious health scare and she was no where to be found…didn’t even call to find out the doctor’s report. I finally realized that she had been his caretaker and I had been hers, but it would never turn into a reciprocal relationship. She could provide tremendous empathy for him, but none for me. I don’t know why, but still tried to accept our relationship for what it was at least in shared interests. Then, in a group we belong to she blamed me behind my back as the reason for an action she took. I was stunned! Finally, I decided distance was my only answer. You really were on target in everything you said. There are many good reasons why people are not there for others – distance, circumstances and Toxicity are right there on the list. But, then there are the people I am talking about in my post. That is another whole thing in my estimation. I’m sure my stepdaughter has all of the feelings you mentioned, but at the base of it all is a very mean, manipulative mother who has used her own children to make other people miserable – because she can and because they would rather let her use them than think on their own. Toxic is not even a strong enough modifier for her behavior. But his daughter will still have to deal with her feelings once he’s gone and nothing I’ve done to get this message across to her will change that. A little about your “friend”. I had a close friend whom I helped through her husband’s Parkinsons. At the same time, she was never really interested in my husband’s cancer journey and I can understand that. Parkinson’s is draining for a caretaker. Thanks, Jo. We removed ourselves from the ex’s toxic presence almost 5 years ago. Any contact with her ended when I finally stood up to her bullying. She didn’t take it well. We make it a point not to go anywhere that she will be. During those 5 years, Charley has entered into clinical studies that have put him in remission. (His diagnosis was terminal before that.) So,along with the treatments, it has worked! The only way she can get to him with her meanness is to use her kids (now in their 30’s). Because he loves them and has always been loyal to them, we deal with this as best we can. The latest incident happened because he could not babysit for her. She threatened to stop him from seeing his grandchildren. She is quite the mean girl when she doesn’t get her way. Like mother, like daughter. But we still have hope. And I am a firm believer in Karma. Goodness, where do I begin!!! There’s so much here I agree with; so many similar episodes I’ve witnessed myself; and so many of the same questions I’ve asked myself many times. We live in a world where technology brings people from all over the world together – but somehow we’re distanced from the ones we’re supposed to be closest to. I know tons of people who would do anything for people they barely know but when it comes to family – forget it! The irony of it all seems lost on them. Oh, I try, but it is so discouraging some days! But vacations do help – Sorry it took so long to get back to you. I’m home for a while, now, so I’ll be more responsible. Sometimes it is less difficult and easier to deal with people and events that doesn’t concern us directly, especially if you are an oversensitive person. I find it difficult to deal with events that involves my fears of losing someone I love and or deceiving someone I love or acting clumsy and stupid, only making matters worst. But I’m not going to act on others people’s problems because I would feel too guilty, getting stuck in some kind of ”paralysis”. Something in my childhood have taught me that I am sociably totally misadapted and every attempt to interact amongst my close peers are considered to be disastrous. I never should have said this, should have done that, etc… BUT I’m still trying…. I stil prefer not to act at all though than to help strangers more than my own. I guess that doesn’t sound very good. I’m not trying to pose as a victim here and pretend I deserve more attention than anyone else and use it as an excuse. I truly feel I’m in no position to help anyone at all, period but like I said… I try, I still keep on trying. Thanks to my therapist, I am trying to not pay attention to criticism and give myself some credit if I do. You are absolutely right, Tobe. We must take care of ourselves if we are to be able to ever help anyone else. That is why I put the poster with those quotes at the beginning of the post. Excellent attitude! This is not a casual post but living life like this has been so casual rather it is the order of the day. Who has to make this understand or was there any fault in bringing up our children. The morals I think have not been passed to the next generation. It shall get still worse. My posts related to this you may refer or read. I hope you shall enjoy them. I shall definitely go through your other posts too and thanks for the follow. I am from India you are from. Good me met, let the journey be fascinating to us both. I’m from the East Coast of the USA – New England. And I live in the smallest of the 50 states – Rhode Island. I love learning about other places from my blog friends. It is truly fascinating! I’ve seen and heard of so many incidences of such things over here, too, Clare. I wouldn’t like to say it’s worldwide, but it seems to be the way of things in most of the ‘developed’ world. There are still communities around today that do care for their elderly. lonely or sick. I’m not sure where we went so wrong. Perhaps it is a case of the hum-drum of every day life, time consuming jobs etc leaving little time. Yet that’s no excuse whatsoever. As you say, many people who virtually ignore the needs of their own close relatives can spend time working for a better life for others many miles away. The saying, ‘Charity begins at home’ has always been true. A very thoughtful and thought-provoking post, Clare. Yes, I’ve heard that even in India the extended family is slowly becoming a thing of the past. Nothing stands still, I suppose. Thanks for the reassurance about the rating. I doubt if the reviewer will go back and notice it. It looks quite odd sitting right next to the word ‘excellent’! You do have ‘Around Zuzu’s Barn’ out, though, don’t you? I thought it was the second book you were working on. Have I got that wrong? I wrote 10 children’s books and compiled them into A Berkshire Tale which was published last year. This year I’ve taken one of the stories, “The Pacas Are Coming!” added some more photos and have turned it into a larger children’s book. That will be published in June, I think. I’ve written additional ZuZu stories but am still looking for an illustrator. Last Train to Kingston has been written as the first in a mystery series, but needs serious edits and rewrites, so who knows what will happen? I’m a late-starter. Very thought provoking post. It makes me sad, and also to resolve to pay more attention to people who matter to me. It is too easy to let ‘being busy’ get it the way. Thanks for this. That is lovely Clare. Today, I rang two people who really matter to me, and caught up with them and what’s going on in their lives. Reading your post this morning prompted me to do this. Thanks. I think we’d make a good partnership. We could encourage people to caller visit a family member or friend and catch-up. I phone my sister every Friday morning and sometimes I’m lucky enough to get her when she’d not busy and we actually have a conversation. Discouraging as it is, I am persistent. I’m glad you were able to connect with your friends. It’s so easy to just drift into a space where time goes by and then it’s just too late.